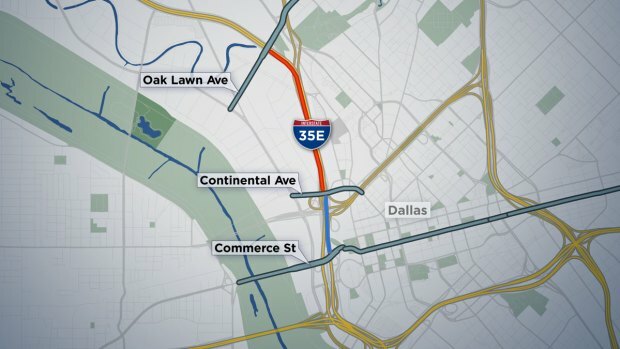 Construction begins Sunday at 9 p.m.
A week of lane closures and construction starts Sunday night for Dallas drivers along Interstate 35E, according to the Texas Department of Transportation. Nightly lane closures begin Sunday at 9 p.m., with the closure of the two right lanes on the northbound side of I-35E between Commerce Street and Continental Avenue, including the northbound exit ramp onto Continental. On the southbound side of I-35E, various lanes will be closed between Oak Lawn Avenue and Commerce Street, including the exit ramps to Oak Lawn and Commerce. The closures will end each morning at 5 a.m., according to TxDOT. From 9 a.m. to 4 p.m. each day, various lanes will be closed on Commerce Street and Reunion Boulevard under I-35E for overhead bridge work, TxDOT said. The construction is part of the Lowest Stemmons Project -- a 2.3 mile, $79 million initiative to improve I-35E from Interstate 30 to Oak Lawn Avenue.